Photograph by Matthew Arthur Williams, at Artists' Moving Image Festival 2016, Tramway, Glasgow. 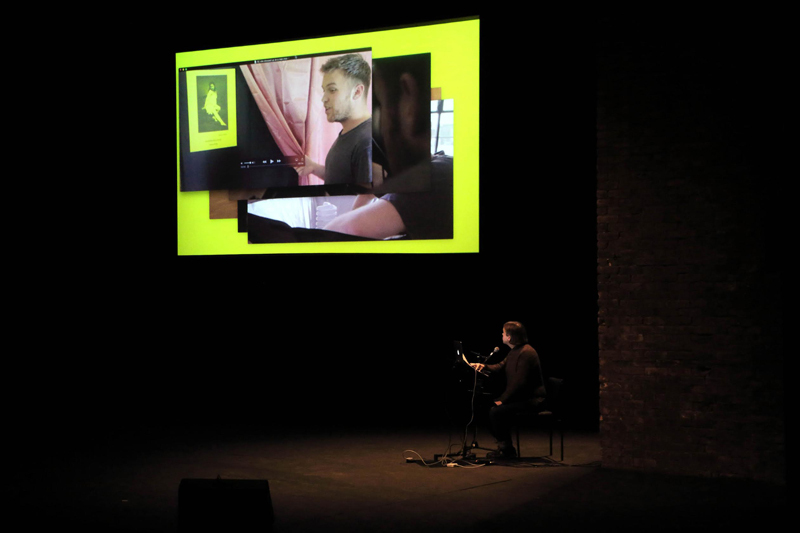 Potash Lesson is a performance concieved for the Artists' Moving Image Festival 2016, at Tramway, Glasgow. Seated, with a microphone and a projected computer screen, I thought about an old video work from 2012. The conceit of this video — a portrait in which a gay man sniffs poppers and strikes a pose from the Iconographie photographique de la Salpêtrière (1876-80) — has been disproven over the years, as the model now identifies as trans. With this context the film has changed in weight and resonance. I thought about the suggestions and challenges of this, both practically and thematically; should the video still be shown? is it upsetting for the model to see, or be seen in? who owns this depiction? what is at stake in displaying someone else? and what happens when transfemininity, rather than gay masculinity, is drawn into contact with the poses and treatments of hysterical women from the 1800s? Styled after popular lectures performed at the Salpêtrière hospital, in which hysterical women were encouraged to perform their symptoms for a public audience, Potash Lesson removes the model from view, and in some ways puts me in her place. From this position themes of trans visibility, feminine pathologisation, interpersonal ethics of collaboration, and the solidity of artist output can be addressed, with the help of a mistranslated play, a scene of humiliation and a chemical stimulant.